Glasgow action in solidarity with socialist Cuba – Boycott Bacardi! 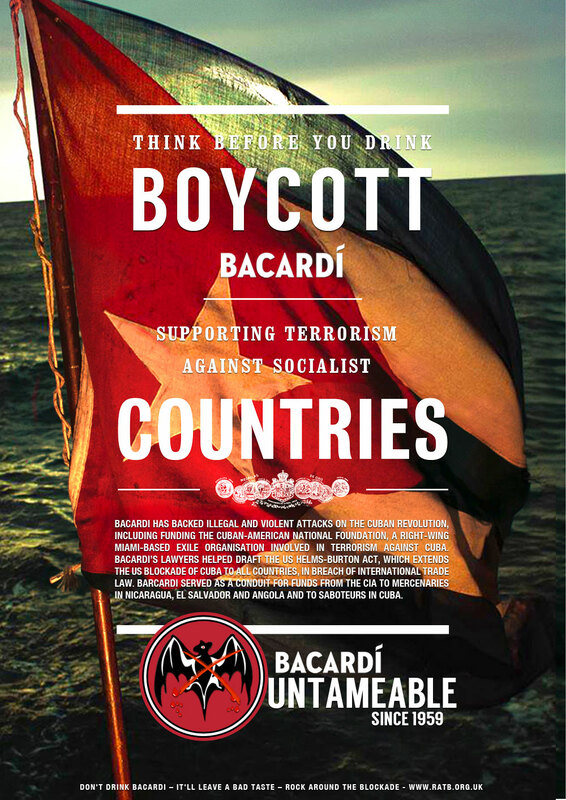 Since 1960, Bacardi has backed illegal and violent attacks against the Cuban Revolution, including funding the Cuban-American National Foundation, a right-wing Miami-based exile organisation involved in terrorism against Cuba. During this time, more than 3,400 Cubans have been killed by terrorism and sabotage. Many of these actions funded by this corporation. Supporters of the Cuban Revolution leafleted those going into the bar and stuck placards and flags against the window for all those inside the bar to see. As curious customers of the bar exited to find out what was happening bar management followed. Attempts to bribe the protest with paella and drinks failed and in response to questions and calls for the bar to end their involvement with Bacardi, management claimed they were just a ‘chain’ and threatened to phone police. We are calling on all supporters of the Cuban Revolution to keep the pressure up by contacting the bar to tell them to end their promotion and sale of Bacardi. We hope to build our own ‘chain’ (of protest!) against Revolucion de Cuba bars across Britain who promote and sell Bacardi so contact us if you are taking action locally. They have bars in Aberdeen, Cardiff, Derby, Glasgow, Harrogate, Leeds, Liverpool, Manchester, Milton Keynes, Norwich, Nottingham, Reading, Sheffield. For facts about the history of Bacardi see. Think before you drink - Boycott Bacardi!